While most comic book properties in the United Stats feature native superheroes, it's important to realize other countries have their own icons too. Our neighbor to the north is no exception. Not only does the new, animated web series Captain Canuck feature Canada's premier superhero, but it's also made of 100% old-fashioned fun! The character was conceived in 1975 by Richard Comely and Ron Leishman, who wanted to create a superhero uniquely Canadian. The self-published comic book became an instant success. In the years since, Captain Canuck has garnered a strong cult following both in Canada and in the United States. In 2012, the property was entrusted to Captain Canuck Incorporated (CCI) founded by Fadi Hakim. The CCI's goal is to expose Captain Canuck to a new audience. The animated web series is part of that initiative, and after viewing the two episodes now available, I'd say it's a smashing success! 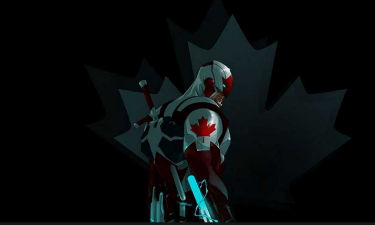 Produced by Big B Comics in conjunction with Scarper Studios and CCI, the premiere episode begins with Captain Canuck, voiced by Kris Holden-Reid (Lost Girl, Dark Matter), attempting to prevent a bomb from destroying the seat of the Canadian government, Parliament Hill. However, the Captain and his associate, Redcoat, voiced by Tatiana Maslany (Orphan Black), begin to suspect something even more sinister is at work. What impressed me the most about the web series is its lightning fast pacing. The moment after the title credits roll, you are immediately dropped into the heat of the action. In fact, more action and intrigue is packed into a four minute episode than some televised dramas have during an entire hour! Instead of having characters standing around speechifying, a lot of background exposition is delivered using a clever plot device. As you witness the Captain searching for the bomb, he is in constant radio communication with Redcoat, who is guiding him by providing crucial mission information. This expository device is effective in providing essential plot details you need to know without slowing down the flow of the narrative. To view all future episodes, visit the series official Youtube channel CaptainCanuckInc. Discover more about the project at the official web site Captain Canuck.com. Like the other stellar web series Heroes Of The North, Captain Canuck is another welcome Canadian contribution to the superhero mythos.